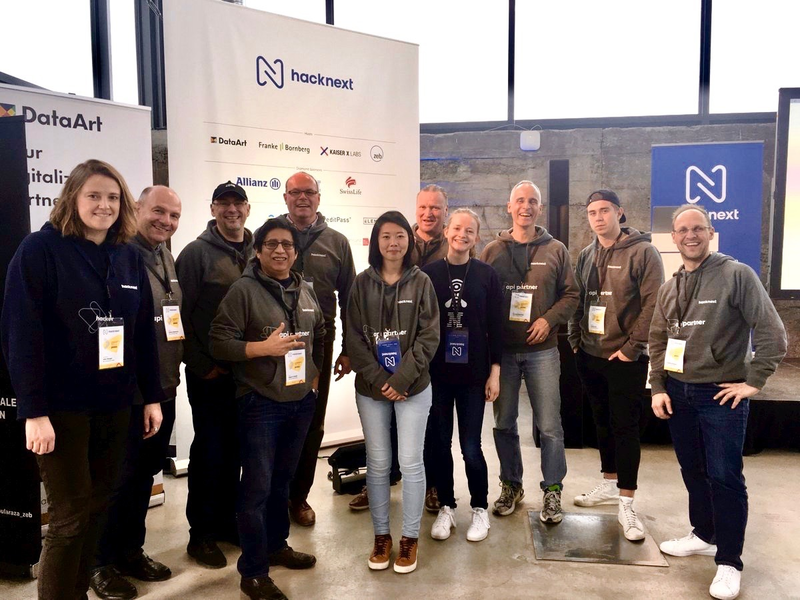 Team IBM was at Hacknext InsurTech hackathon and conference from Thursday March 7th to Saturday March 9th, in Munich. Across three days, 110 hackers came together to take on a variety of real-life challenges facing the industry. As technology sponsor, we had a team of experts ready to assist the hackers with their projects. Most of the challenges revolved around modernizing or making the insurance industry more accessible. A fantastic location for ideation and collaboration. Each team was required to address a minimum of one of the following challenges. Which concepts will help people to plan for the future? How can we present these issues more accessibly? How will the insurance industry of the future contact their customers? How can insurance companies use the data they have to make their customers’ lives easier? Which new technologies and techniques can optimise insurance portfolios? IBM sponsored the event alongside DataArt, Kaiser X Labs, Franke & Bornberg, and zeb, a mix of local companies and start-ups. Together we embarked on the challenge of revamping and redesigning the insurance industry. A fantastic team organized and ran the entire Hacknext event. From the start of the hackathon, we were given detailed instructions about what to expect with regards to the location, the competition, and more. Hackers could choose from 10 APIs to use, with lots of opportunities for creating innovative solutions. Many sponsors had their unique spin on the challenges, for which they offered corresponding prizes. As such, the challenges all reflected problems which the German and international insurance industry faces. On Thursday, Hackers had 30-second mini-pitches to build their teams as quickly as possible. In the pitches, they presented their vision and ideas for the hackathon, which challenge they would tackle, and what skills and experience they needed from teammates. Teams were mainly looking for developers, business-minded individuals, or designers. Fast-paced matchmaking ensued! At the end of the day, the participants had formed 20 teams. The first evening ended with a special presentation on artificial intelligence (AI) in space, with lead Watson architect Matthias Biniok sharing the story of this joint project with Airbus, German Aerospace Center DLR, and IBM to create the first AI-powered astronaut assistant in space. CIMON, an AI-powered assistant, joined astronaut Alexander Gerst on the International Space Center for the Horizons misson, as the first robot to fly autonomously and weightlessly. Discover more about the CIMON project, which just won the German Innovation Award. Bright and early on Friday morning, the teams embarked on their challenge. They had 28 hours of coding to create their winning solution. 28 hours is not a lot of time to create a prototype from scratch. Seven coaching sessions were held to support the teams in their quests, covering all areas critical for success: technology, design, business, and pitching. IBM held two sessions. Thomas Suedbroecker shared all that is possible with our cloud platform, including hot tips on how to create and deploy an application as quickly as possible. Each API had a corresponding team of coaches to assist with implementation throughout the hackathon. Our team of API coaches were kept very busy, answering lots of questions and assisting hackers with their projects. Prizes included up to €10,000 in cash as well as special prizes from the sponsors. On the judging panel were leaders in the insurance industry, including Michael Baierlein, Director of Cloud and Cognitive Sales at IBM and Christoph Carl, Project Lead Bancassurance at Allianz. This team delivered a great pitch! Their solution consolidated risk management and eCommerce financial status on one platform. This is both a modern and scalable business model. Team i-Gent vividly demonstrated how ad-hoc insurance businesses can be easier to handle in an end-to-end solution. Congratulations to the team! Another fantastic pitch and solution that consolidated risk management as well as financial status for eCommerce on one platform. Well done for creating a modern and scalable business model. The challenges facing the insurance industry are great. Hacknext brought together a wide group of people who focused on how to improve the insurance industry. We were particularly happy to see all three winners running on IBM Cloud! Well done to all the participants. Congratulations on all your hard work and achievements.